This list serves as an introduction to the role of the microbiome, epigenetics and nutrient imbalances in mental health. Though these areas are listed separately, they are constantly interacting to make us who we are. Environment = our past experiences (good and bad - ie. attachment, trauma, peace/contentment), daily lifestyle (exercise, diet, stress), exposures (infection, toxins and metals, antibiotics, etc). 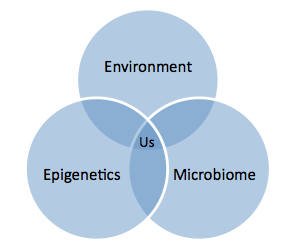 These factors can affect both our micro biome and the expression of our genes. Micro-biome = the gut micro biome contains 100 trillion microbes - 10 times the number of cells in our body. If it's not in good shape (because of environment), we're more vulnerable to exposures, more deficient in nutrients, and our immune system is out of whack - all of which can affect the entire body, including the brain. Epigenetics = changes in the way our genes are expressed. This can be influenced by our environment and micro biome - i.e., we may be born with a mutation that makes us more vulnerable to depression, but that gene may not be expressed unless something occurs in our environment or lifestyle to turn that mutation on - ie. trauma, an environmental exposure, diet, etc.